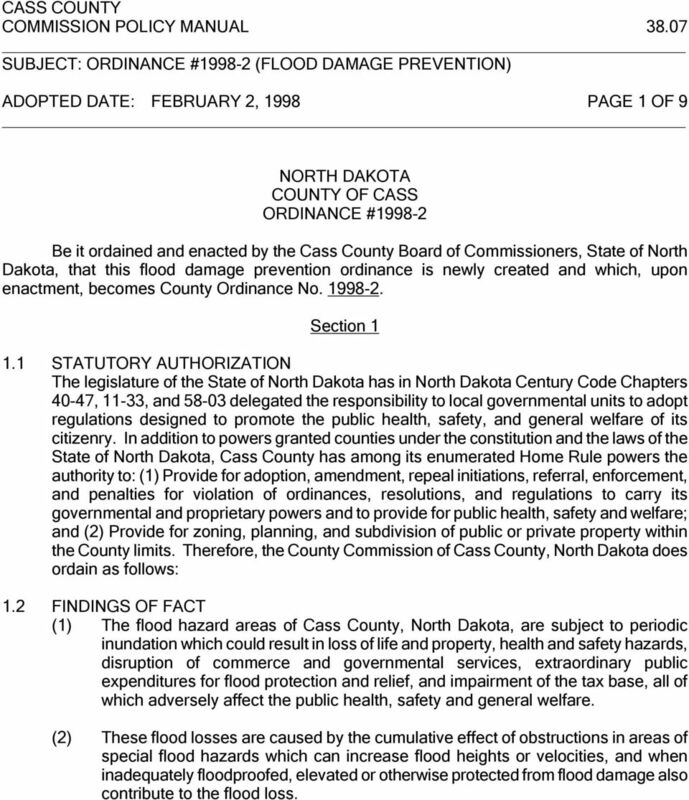 Download "CASS COUNTY COMMISSION POLICY MANUAL 38.07 ADOPTED DATE: FEBRUARY 2, 1998 PAGE 1 OF 9"
1 CASS COUNTY COMMISSION POLICY MANUAL SUBJECT: ORDINANCE # (FLOOD DAMAGE PREVENTION) ADOPTED DATE: FEBRUARY 2, 1998 PAGE 1 OF 9 NORTH DAKOTA COUNTY OF CASS ORDINANCE # Be it ordained and enacted by the Cass County Board of Commissioners, State of North Dakota, that this flood damage prevention ordinance is newly created and which, upon enactment, becomes County Ordinance No Section STATUTORY AUTHORIZATION The legislature of the State of North Dakota has in North Dakota Century Code Chapters 40-47, 11-33, and delegated the responsibility to local governmental units to adopt regulations designed to promote the public health, safety, and general welfare of its citizenry. In addition to powers granted counties under the constitution and the laws of the State of North Dakota, Cass County has among its enumerated Home Rule powers the authority to: (1) Provide for adoption, amendment, repeal initiations, referral, enforcement, and penalties for violation of ordinances, resolutions, and regulations to carry its governmental and proprietary powers and to provide for public health, safety and welfare; and (2) Provide for zoning, planning, and subdivision of public or private property within the County limits. Therefore, the County Commission of Cass County, North Dakota does ordain as follows: 1.2 FINDINGS OF FACT (1) The flood hazard areas of Cass County, North Dakota, are subject to periodic inundation which could result in loss of life and property, health and safety hazards, disruption of commerce and governmental services, extraordinary public expenditures for flood protection and relief, and impairment of the tax base, all of which adversely affect the public health, safety and general welfare. (2) These flood losses are caused by the cumulative effect of obstructions in areas of special flood hazards which can increase flood heights or velocities, and when inadequately floodproofed, elevated or otherwise protected from flood damage also contribute to the flood loss. 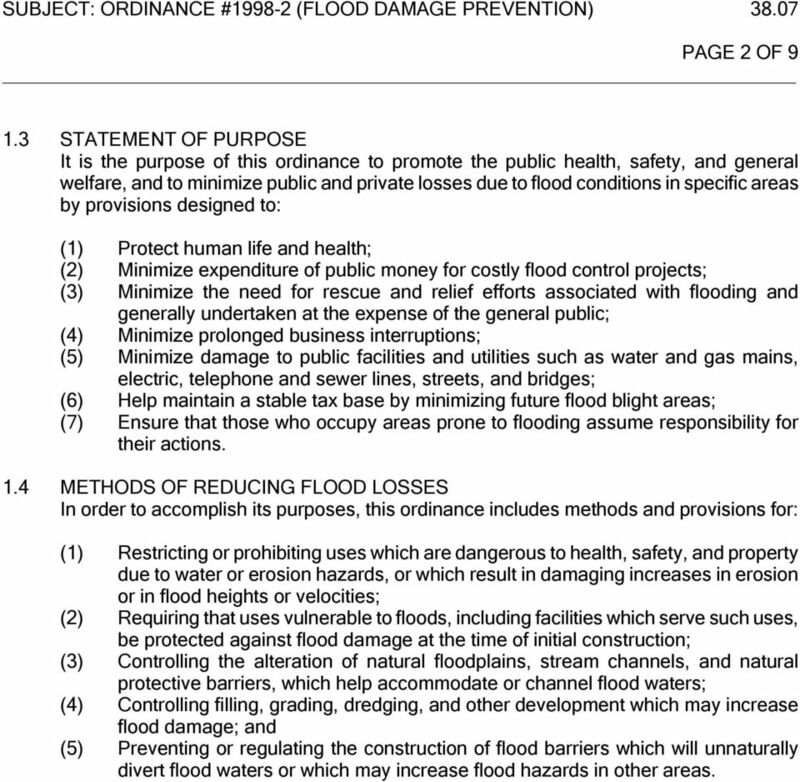 2 PAGE 2 OF STATEMENT OF PURPOSE It is the purpose of this ordinance to promote the public health, safety, and general welfare, and to minimize public and private losses due to flood conditions in specific areas by provisions designed to: (1) Protect human life and health; (2) Minimize expenditure of public money for costly flood control projects; (3) Minimize the need for rescue and relief efforts associated with flooding and generally undertaken at the expense of the general public; (4) Minimize prolonged business interruptions; (5) Minimize damage to public facilities and utilities such as water and gas mains, electric, telephone and sewer lines, streets, and bridges; (6) Help maintain a stable tax base by minimizing future flood blight areas; (7) Ensure that those who occupy areas prone to flooding assume responsibility for their actions. 1.4 METHODS OF REDUCING FLOOD LOSSES In order to accomplish its purposes, this ordinance includes methods and provisions for: (1) Restricting or prohibiting uses which are dangerous to health, safety, and property due to water or erosion hazards, or which result in damaging increases in erosion or in flood heights or velocities; (2) Requiring that uses vulnerable to floods, including facilities which serve such uses, be protected against flood damage at the time of initial construction; (3) Controlling the alteration of natural floodplains, stream channels, and natural protective barriers, which help accommodate or channel flood waters; (4) Controlling filling, grading, dredging, and other development which may increase flood damage; and (5) Preventing or regulating the construction of flood barriers which will unnaturally divert flood waters or which may increase flood hazards in other areas. 3 PAGE 3 OF 9 Section 2 DEFINITIONS Unless specifically defined below, words or phrases used in this ordinance shall be interpreted so as to give them the meaning they have in common usage and to give this ordinance its most reasonable application. Base flood means the flood having a one percent chance of being equaled or exceeded in any given year. Development means any manmade change to improved or unimproved real estate, including but not limited to grading, paving, excavation or drilling operations located within the area of special flood hazard. Flood or flooding means a general and temporary condition of partial or complete inundation of normally dry land areas from: (1) the overflow waters, and/or (2) the unusual and rapid accumulation or runoff of surface water from any source. Lowest floor means the lowest floor of a structure including the basement. Manufactured home means a structure that is transportable in one or more sections, built on a permanent chassis, and designed to be used with or without a permanent foundation. It does not include recreational vehicles or travel trailers unless placed on a site for 180 consecutive days or more. New construction means structures for which the start of construction commenced on or after the effective date of this ordinance. Structure means a walled and roofed building, including manufactured homes as well as gas or liquid storage tanks above the ground. Substantial improvement means any repair, reconstruction, or improvement of a structure, the cost of which equals or exceeds 50 percent of the market value of the structure before the improvement or repair is started. This term includes structures which have incurred substantial damage regardless of the actual repair work performed. 4 PAGE 4 OF 9 The term does not, however, include either: (1) Any project for improvement of a structure to comply with existing state or local health, sanitary, or safety code specifications which are solely necessary to assure safe living conditions; or (2) Any alteration of a structure listed on the National Register of Historic Places or on a State Inventory of Historic Places. Violation means a failure of a structure or other development to be fully compliant with the community s floodplain management ordinance. 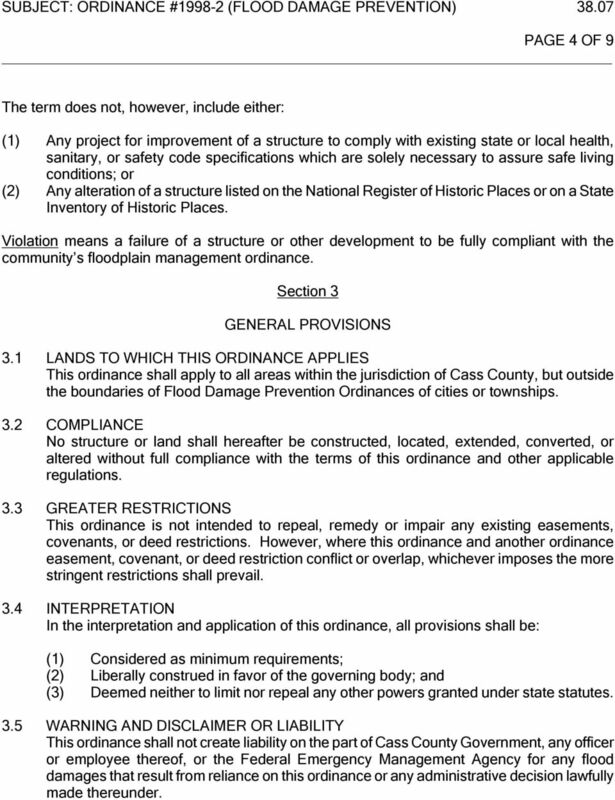 Section 3 GENERAL PROVISIONS 3.1 LANDS TO WHICH THIS ORDINANCE APPLIES This ordinance shall apply to all areas within the jurisdiction of Cass County, but outside the boundaries of Flood Damage Prevention Ordinances of cities or townships. 3.2 COMPLIANCE No structure or land shall hereafter be constructed, located, extended, converted, or altered without full compliance with the terms of this ordinance and other applicable regulations. 3.3 GREATER RESTRICTIONS This ordinance is not intended to repeal, remedy or impair any existing easements, covenants, or deed restrictions. However, where this ordinance and another ordinance easement, covenant, or deed restriction conflict or overlap, whichever imposes the more stringent restrictions shall prevail. 3.4 INTERPRETATION In the interpretation and application of this ordinance, all provisions shall be: (1) Considered as minimum requirements; (2) Liberally construed in favor of the governing body; and (3) Deemed neither to limit nor repeal any other powers granted under state statutes. 3.5 WARNING AND DISCLAIMER OR LIABILITY This ordinance shall not create liability on the part of Cass County Government, any officer or employee thereof, or the Federal Emergency Management Agency for any flood damages that result from reliance on this ordinance or any administrative decision lawfully made thereunder. 5 PAGE 5 OF 9 Section 4 ADMINISTRATION 4.1 ESTABLISHMENT OF DEVELOPMENT PERMIT A development permit shall be obtained before construction or development begins within the community. Application for a development permit shall be made on forms furnished by the County Engineer or his/her designee and may include, but not be limited to: plans in duplicate drawn to scale showing the nature, location, dimensions, and elevations of the areas in question; existing or proposed structures, fill, storage of materials, drainage facilities; and the location of the foregoing. 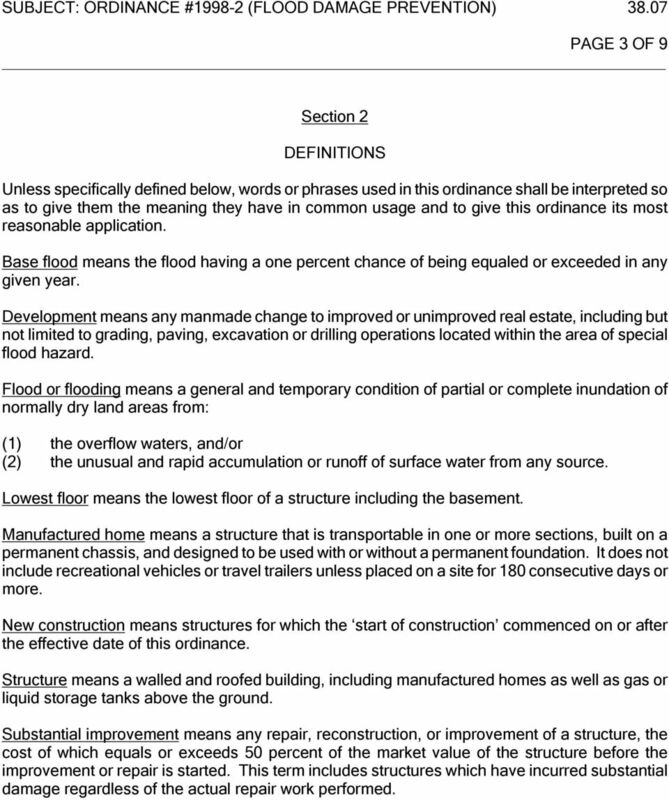 4.2 DESIGNATION OF FLOODPLAIN ADMINISTRATOR The County Engineer is hereby appointed to administer and implement this ordinance by granting or denying development permit applications in accordance with its provisions. 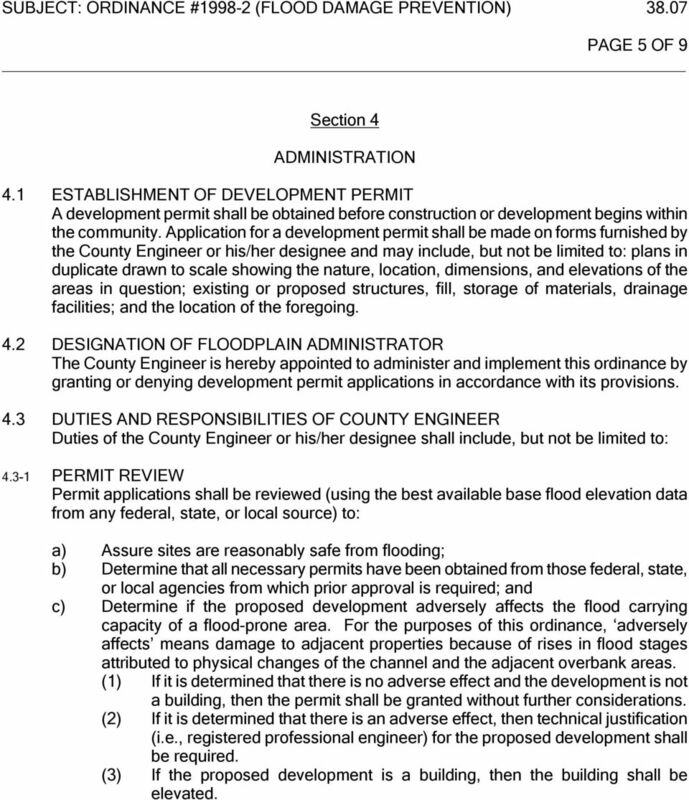 4.3 DUTIES AND RESPONSIBILITIES OF COUNTY ENGINEER Duties of the County Engineer or his/her designee shall include, but not be limited to: PERMIT REVIEW Permit applications shall be reviewed (using the best available base flood elevation data from any federal, state, or local source) to: a) Assure sites are reasonably safe from flooding; b) Determine that all necessary permits have been obtained from those federal, state, or local agencies from which prior approval is required; and c) Determine if the proposed development adversely affects the flood carrying capacity of a flood-prone area. For the purposes of this ordinance, adversely affects means damage to adjacent properties because of rises in flood stages attributed to physical changes of the channel and the adjacent overbank areas. (1) If it is determined that there is no adverse effect and the development is not a building, then the permit shall be granted without further considerations. (2) If it is determined that there is an adverse effect, then technical justification (i.e., registered professional engineer) for the proposed development shall be required. (3) If the proposed development is a building, then the building shall be elevated. 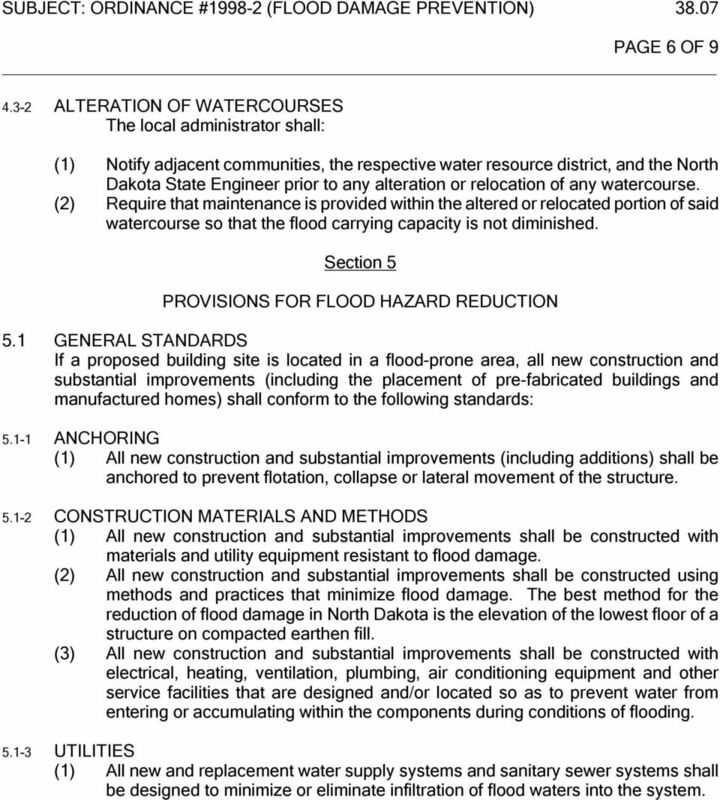 6 PAGE 6 OF ALTERATION OF WATERCOURSES The local administrator shall: (1) Notify adjacent communities, the respective water resource district, and the North Dakota State Engineer prior to any alteration or relocation of any watercourse. (2) Require that maintenance is provided within the altered or relocated portion of said watercourse so that the flood carrying capacity is not diminished. Section 5 PROVISIONS FOR FLOOD HAZARD REDUCTION 5.1 GENERAL STANDARDS If a proposed building site is located in a flood-prone area, all new construction and substantial improvements (including the placement of pre-fabricated buildings and manufactured homes) shall conform to the following standards: ANCHORING (1) All new construction and substantial improvements (including additions) shall be anchored to prevent flotation, collapse or lateral movement of the structure CONSTRUCTION MATERIALS AND METHODS (1) All new construction and substantial improvements shall be constructed with materials and utility equipment resistant to flood damage. (2) All new construction and substantial improvements shall be constructed using methods and practices that minimize flood damage. The best method for the reduction of flood damage in North Dakota is the elevation of the lowest floor of a structure on compacted earthen fill. (3) All new construction and substantial improvements shall be constructed with electrical, heating, ventilation, plumbing, air conditioning equipment and other service facilities that are designed and/or located so as to prevent water from entering or accumulating within the components during conditions of flooding UTILITIES (1) All new and replacement water supply systems and sanitary sewer systems shall be designed to minimize or eliminate infiltration of flood waters into the system. 7 PAGE 7 OF 9 (2) New and replacement sanitary sewage systems shall be designed to minimize or eliminate infiltration of flood waters into the systems and discharge from the systems into flood waters. (3) On-site waste disposal systems shall be located to avoid impairment or contamination during flooding SUBDIVISION PROPOSALS (1) All subdivision proposals shall be consistent with the need to minimize flood damage; (2) All subdivision proposals shall have public utilities and facilities such as sewer, gas, electrical, and water systems located and constructed to minimize flood damage; (3) All subdivision proposals shall have adequate drainage provided to reduce exposure to flood damage. 5.2 SPECIFIC STANDARDS (1) Structures Within the Flood Plain All construction within the flood plain to meet the following requirements: A. Elevations Lowest Floor Fill around building Fill 25' away from building 2.5' above BFE 2.0' above BFE At BFE B. Infrastructure Elevations 1) All streets and roads within new subdivisions to be constructed to BFE plus 1.0'. 2) All sanitary sewer facilities including private sewer connection manholes, cleanouts, etc. to be protected to an elevation of BFE plus 2.5'. Protection measures to include sealing and/or elevating. 3) Storm sewers to be protected to an elevation of BFE plus 1.0' and isolated from other storm sewer systems. C. Floodway Setback All structures to be set back 100' from floodway line. 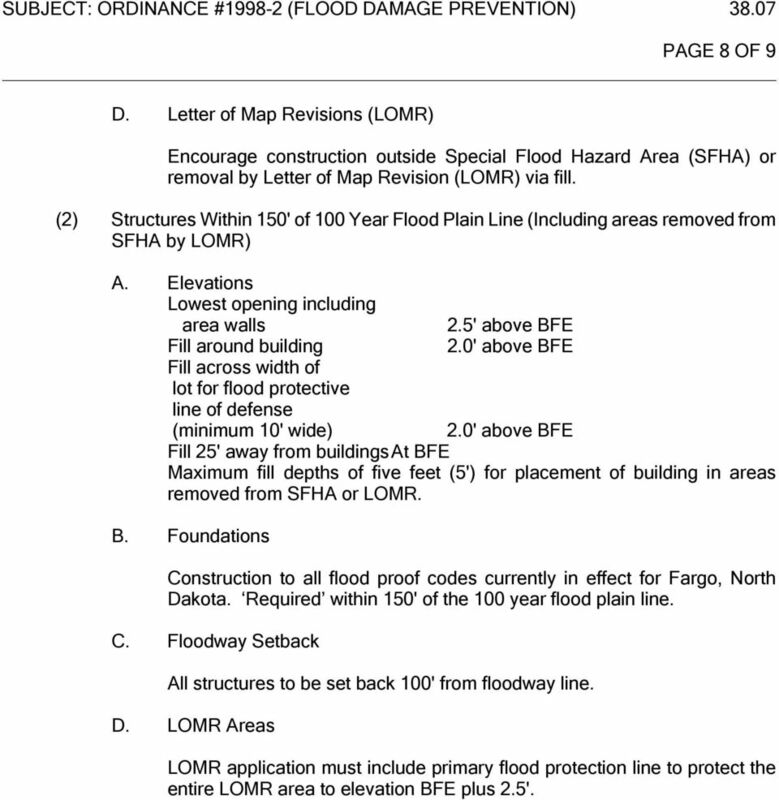 8 PAGE 8 OF 9 _ D. Letter of Map Revisions (LOMR) Encourage construction outside Special Flood Hazard Area (SFHA) or removal by Letter of Map Revision (LOMR) via fill. 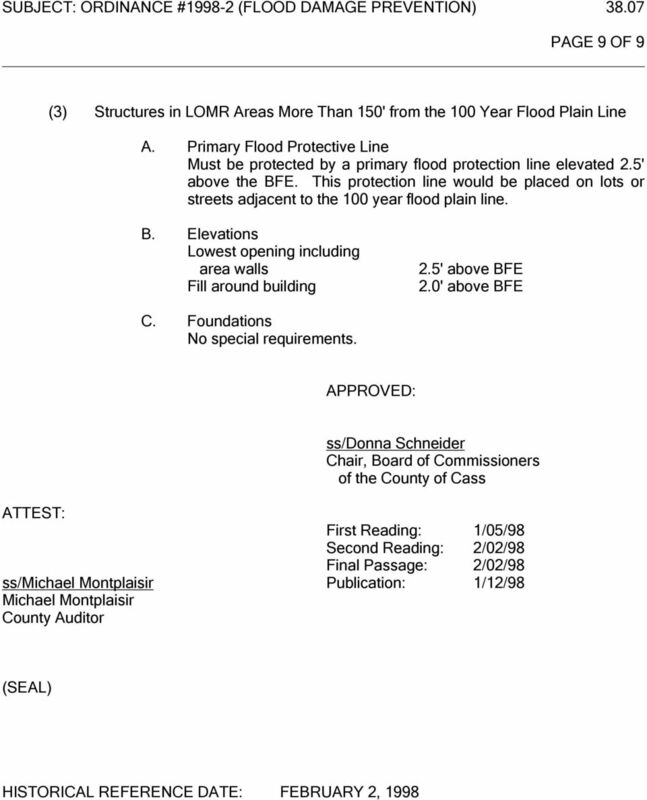 (2) Structures Within 150' of 100 Year Flood Plain Line (Including areas removed from SFHA by LOMR) A. Elevations Lowest opening including area walls Fill around building Fill across width of lot for flood protective line of defense (minimum 10' wide) 2.5' above BFE 2.0' above BFE 2.0' above BFE Fill 25' away from buildings At BFE Maximum fill depths of five feet (5') for placement of building in areas removed from SFHA or LOMR. B. Foundations Construction to all flood proof codes currently in effect for Fargo, North Dakota. Required within 150' of the 100 year flood plain line. C. Floodway Setback All structures to be set back 100' from floodway line. D. LOMR Areas LOMR application must include primary flood protection line to protect the entire LOMR area to elevation BFE plus 2.5'. ARTICLE 5. FLOOD DAMAGE PREVENTION 1. Statutory Authorization, findings of fact, purpose and objectives. Last Revision Date: May 12, 1998 TABLE OF CONTENTS SECTION 100 - STATUTORY AUTHORIZATION, FINDINGS OF FACT, TITLE, PURPOSE AND METHOD..2 101. STATUTORY AUTHORIZATION 102. FINDINGS OF FACT 103. TITLE 104. Chapter 141, FLOOD DAMAGE PREVENTION [HISTORY: Adopted by the Mayor and Council of the Borough of Laurel Springs 9-10-2007 by Ord. No. 691-2007. Elmore County Flood Damage Prevention Ordinance (Non-Coastal Communities) Adopted: April 20, 2006 Amended: July 11, 2011 FLOOD DAMAGE PREVENTION ORDINANCE Non-Coastal Communities ARTICLE 1. SECTION A. ARTICLE 22. FLOOD DAMAGE PREVENTION 22-1. Statutory Authorization. 22-2. Findings of Fact. 22-3. Statement of Purpose. 22-4. Objectives. 22-5. Definitions. 22-6. Lands to which this Article applies. 22-7. Chapter 84 FLOOD DAMAGE PREVENTION 84-1. Statutory authorization. 84-14. Application information. 84-2. Findings offact. 84-15. Duties and responsibilities of 84-3. Statement ofpurpose. Building Official. B. Minimize expenditure of public money for costly flood control projects. Chapter 12 FLOOD DAMAGE PREVENTION?? Chapter 12 FLOOD DAMAGE PREVENTION?? Art. I. In General, 12-1--12-35 Art. II. Administration and Enforcement, 12-36--12-60 Art. III. 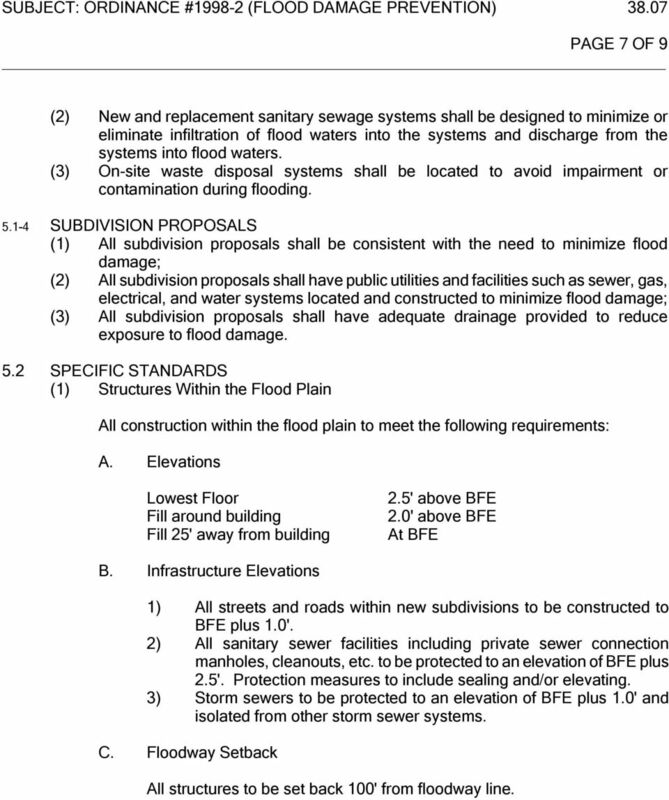 Provisions for Flood Hazard Reduction, 12-61--12-67 Sec. 12-1. Definitions. Appeal means a request for a review of the county's interpretation of any provision of this article or a request for a variance.